The choice of Gertrude Mongella to be the President of the Pan-African Parliament last week was not by chance, it was a commitment by this continent to gender equality and the first step towards the appearance of the African continent as an equal partner on the stage of international relations. A new image for a New Partnership for African Development. Born in 1955 on the Isle of Ukewere, Lake Victoria, Tanzania (then Tanganyika), Gertrude Mongella celebrated her 50th birthday as Chairperson of the Fourth UN World Conference on Women in Beijing, a position which earned her the title of Mama Beijing. After leaving her island at 12 years of age to study at a mission, she later went to the University College of Dar-es-Salaam, Tanzania, where she graduated in educational studies and in 1975, entered politics as a member of the East African Legislative Assembly. After being appointed Minister of State for Women's Affairs, she became Minister of Lands, Natural Resources and Tourism from 1985 to 1987 and for the following four years, worked at the Tanzanian President's Office as Minister Without Portfolio. From 1982 to 1991, she was the Head of the Social Services Department at the ruling party's headquarters in Tanzania and in 1991, was appointed High Commissioner to India. She represented Tanzania in numerous conferences dedicated to women's rights and the environment during the 1980s and early 1990s, being appointed vice-chair of the World Conference to Review and Appraise the Achievement on the UN Decade for Women, performing similar duties for the UN before her appointment to Beijing in 1995. 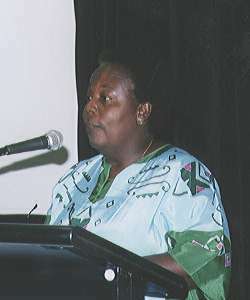 In 1996, she was chair of the Women's World Leadership Forum on Peace in Johannesburg, which resulted in the constitution of the African Women's Committee for Peace and Development and in 1997, she took part in the Pan-African Conference on Peace, Gender and development, calling on women in Rwanda to fight against intolerance and to convince their men to stop fighting. In 1998, she was invited to return to Beijing by the women of China to speak about women's rights and since then took up several advisory positions at the United Nations. Her constant emphasis on debate and dialogue and the need to have clear principles was exemplified in her statement at the African Women's Forum, chaired by Graзa Machel (1997), at which she stated: "You have to be clear what you want and what you stand for. You must stand for principle. Principle will never let you down...You have to be able to choose what are the principles worth dying for". For this commitment to principles, to women's rights and to debate, discussion and dialogue, Gertrude Mongella was chosen to be the first President of the Pan-African Parliament in Addis Ababa last week.